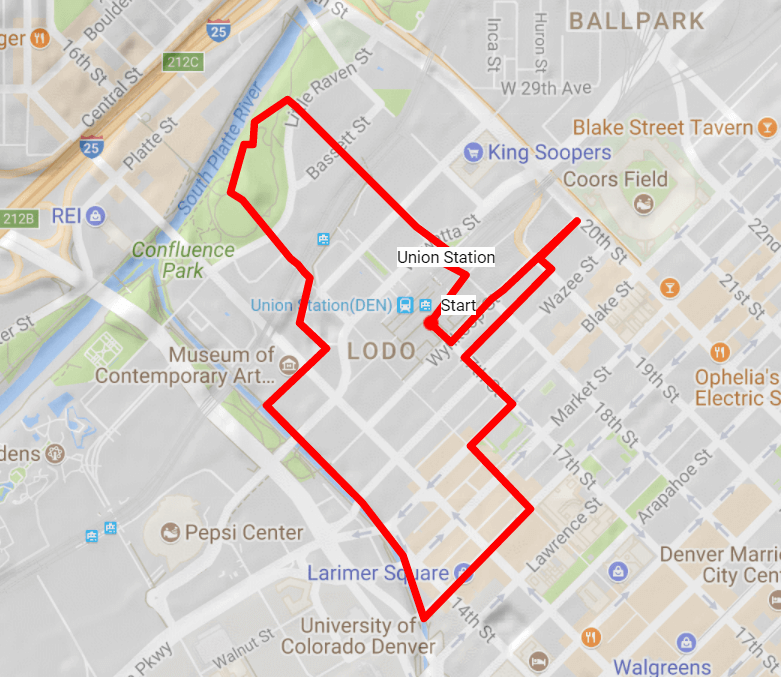 Union Station neighborhood, which is basically what the locals call “LoDo,” is a small and very dense neighborhood. If you’ve ever taken the train into Union Station, you’ve ridden right through it. The boundaries are the Platte River, 14th St, 20th St and Larimer. When walking this neighborhood, arrive at Union Station via the train or public transit and save yourself the headaches of trying to park. Be sure not to miss the darling and often overlooked “Evolution of the Ball” sculpture at the entry into the Coors Field ballpark, which happens to be in the Five Points neighborhood but its entry is officially in Union Station’s neighborhood. See if you can find The Masquerade Ball! 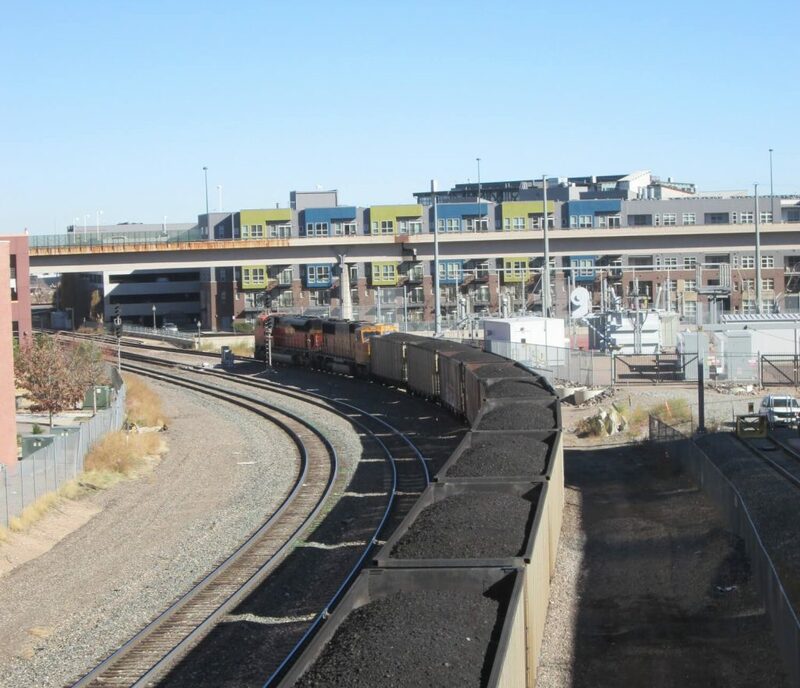 As you cross the three pedestrian bridges on this route, be sure to eye the north/south views along the train tracks and the east/west views up the Streets and to the Rockies. This walk arguably has the best views in Denver, seconded only by Green Valley Ranch’s! At one time, the employee responsible for raising and lowering the arm for pedestrian traffic at Union Station did it every 7 seconds due to the amount of trains coming through Denver. Finally, whether at the beginning or end of your walk, enjoy Union Station, originally built in the 1890s only to burn, rebuild, burn, remodel, renovate, and restore! 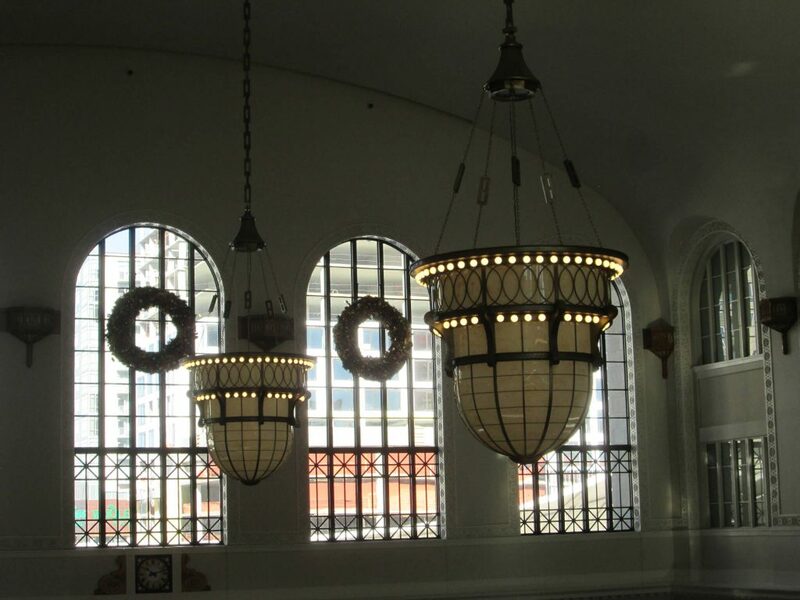 Marvel at the restored chandeliers from the upstairs lounge, gobble good eats from any of the restaurants, and be sure to buy a copy of my book, The Best Urban Hikes: Denver, from the Tattered Cover inside Union Station! 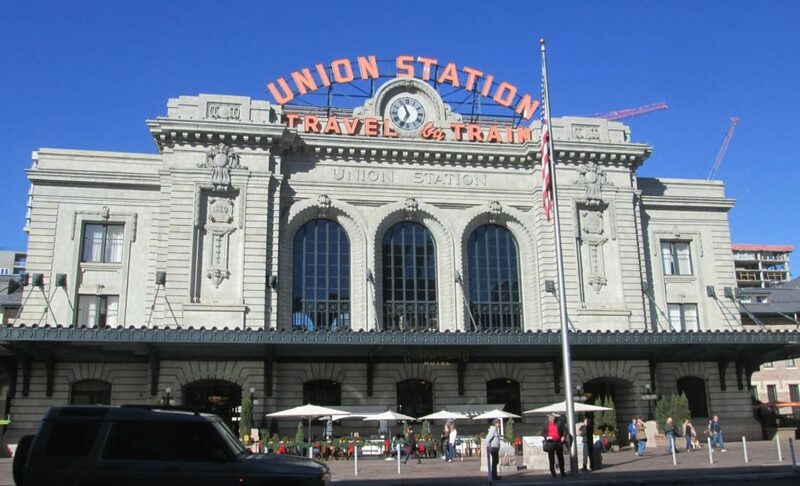 Start inside Union Station at 1701 Wynkoop St. Tour the station, making sure you go upstairs to the lounge and look east up 17th St. Admire the chandeliers from the second floor, go to the basement and see the old bathrooms, and generally just explore the station. When you’re ready, exit the rear of the station, go to the right, and take the left up the stairs over the train tracks. Exit the stairs onto 18th St, heading westerly and crossing Wewatta and Chestnut. Take the second set of stairs over the freight rail tracks, exiting onto 18th and crossing Bassett. At Little Raven, take a left. Walk through the park toward the south, following the trails and enjoying the Platte River. Work your way back toward Little Raven to use the pedestrian bridge, also known as Millennial Bridge. Play in the large red reed sculpture at the foot of the steps, then go up the steps, crossing back over the tracks and down to 16th Street. Take a right on Chestnut Pl and then a right on Delgany. Cross 15th St and pass the Museum of Contemporary Art and its Toxic Schizophrenia piece. Right before Cherry Creek take a left, walking easterly above the Creek. Continue along the Creek, taking the ramp down to the Creek. At Larimer, take the ramp back up to 15th Street, and continue on Larimer toward 16th St. 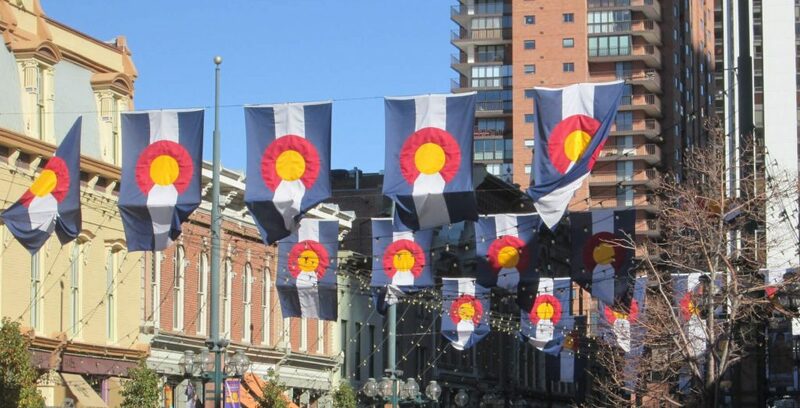 Walk through historic Larimer Square. There are various plaques on the buildings telling historical moments that you may enjoy. Continue on Larimer to 16th St, take a left. Walk along 16th St to Blake St and take a right. Take a left on 17th, enjoying the views of Union Station. You’ll pass the Oxford Hotel. If you’re in the mood, visit the lobby of the Oxford to enjoy their fabulous western art collection, and peek into the Cruise room to see their Art Deco wall sconces. Leave the Oxford, walking down the alley between Wynkoop and Wazee toward 20th. 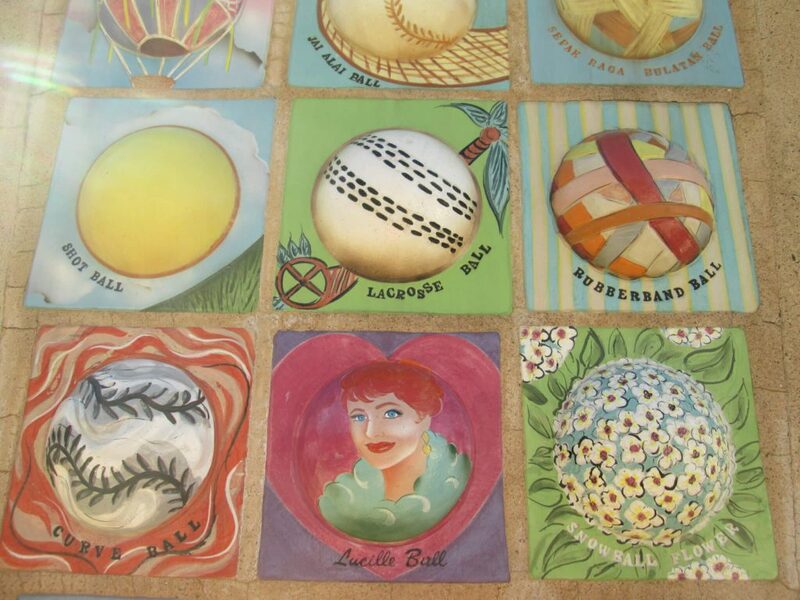 At 20th, approach the entry to the Ballfield to find the Evolution of the Ball sculpture. Once you’ve enjoyed the artwork, turn toward Wynkoop. Walk along Wynkoop, passing the original Union Station on the right and Wynkoop Brewery, founded by Governor Hickenlooper before he was Governor, on your left. Return back to Union Station where you started.